The above is mentioned in Secretary Dave Johnson's notes for the 20th Annual Diner and Presentation (Archives 1974/75). Farmer Mr. M. Hodgson, of Winster House, Sandsend, with the 21 lb 00 1/2 oz cod which he caught on Sandsend beach at ebb tide between 7pm and 830pm on December 30th. 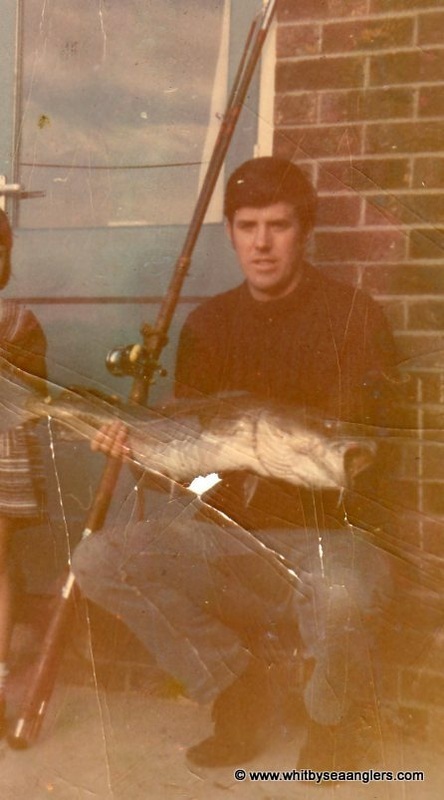 The fish is thought to be a local record for a rod caught cod from the beach in the Whitby area. Mr. Hodgson was using a 12 foot hollow glass beachcaster rod, multiplier reel 6/0 hook, main line 35 lb breaking strain, trace line 26 lb and lug worm bait. His cast was about 100 yards out on sandy beach. The fish was 37 inches long and a girth of 24 1/2 inches. It took ten minutes to land in heavy swell and surf. In the same 90 minutes session, Mr Hodgson took another 5 cod, giving him a total weight of 38 lb. Fishing with Mr. Hodgson were Andrew Marr, Bernard Stebbings and Paul Kilpatrick, who took six fish each. All four are members of Whitby Sea Anglers Association. Dave Johnson, WSAA Treasurer, photograph courtesy Dave Johnson.